I just picked up a few things at Dominion Memorial Market. 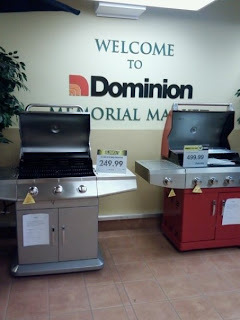 No complaints from me on their service today, but on my way out, I noticed their barbecue display. See the pricetags? You would think that store standards would be followed by all members in a particular chain. I wonder why Memorial Market can manage to price their bigger-ticket items but not Blackmarsh Market? Blackmarsh Market seems to have completely abandoned service in their non-grocery items. One time I went there to purchase an advertised 7-piece bed set. It was nowhere to be found in store. I walked around for awhile and couldn't find any staff, so I went up to the register. A clerk came down to help me but basically followed my own strategy of wandering aimlessly. Then he went in the back room for awhile, and brought out what I assume was a manager. They could not even confirm whether the item was available. I asked if there was anyone I could call or if I could come back at a better time, they told me no. They said they don't really monitor stock in housewares, or know what exactly will be available/how many. This attitude seems to be rampant everywhere I go these days. No one knows if and when product will be available. It's always "try your luck later" or "we never know when we'll get more in". How is this possible? How can stock be so poorly managed? A store should be able to tell me precisely when they'll have something in and how many they're getting. I gave up on the bed set after being told that, as I had no desire to continually drop by and see if they had any. This doesn't surprise me at all. I wonder sometimes if the presence of the self-serve checkouts at this particular Dominion is demoralizing for the employees? Knowing that their shift is being taken by a machine probably isn't great for morale. I don't know what the excuses are at other places, though! It's not always that easy. I work in retail and often customers will ask about an out of stock product. We receive notices from Head Office occasionally about ETAs for certain products, and we know what items will arrive on the next shipment a week in advance, but other products are not on our shipment lists and only shown as "on order" with no ETA given. When asked when it will arrive, the only response we can give is that we don't know when it will be coming back into stock, but it should eventually. We take names and phone numbers and we do call the customer when the item is available, but you have to remember that it's not always the employees fault. I would tell you when the product was expected - if I knew. I hear where you're coming from, too. I also work in retail and often get annoyed by not knowing when out of stock products will be available. I think it all depends on the presentation - in your case (as I'm sure you know! ), you provide a great service to your customer by taking their contact info for notification when their product is available. In the case that jwpeddle is describing, it seems there might be a 'not my problem' attitude coming from some employees, which frustrates the customer who has already been disappointed.